Child's Play has already raised $1.5 million this year. It doesn't look like it'll be long before it passes this year's goal and (probably) last year's record. Last year, the Child's Play charity raised a record-breaking amount of money (to the tune of $2,294,317) to help out kids. This year, the charity has raised over $1.5 million so far and it's expected that it'll surpass its target goal pretty soon. 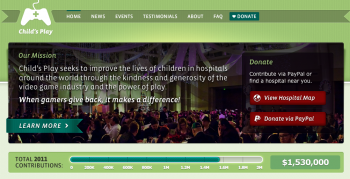 The charity's organizers are hoping to raise at least $2 million in donations this year. That seems easily achievable, given how many events are planned to benefit Child's Play over the next two weeks. Also, it's been revealed that the charity has raised over $10 million since it was established back in 2003. If you've ever donated to Child's Play, give yourself a pat on the back. $10 million is a great deal of money and it's undoubtedly done a lot of good for sick children. That said, if you've been meaning to donate this year and haven't gotten around to it so far, you can still head over to the charity's website and do so.